The Sky Blues’ 1-1 draw with Cliftonville on Saturday – when Johnny McMurray cancelled out the hosts’ early opener from Ryan Curran – officially ended what slim hopes Jeffrey’s troops had of pipping Linfield to the Danske Bank Premiership crown but, far from reflecting on what might have been, the United boss insisted that nothing has changed for him or his team. 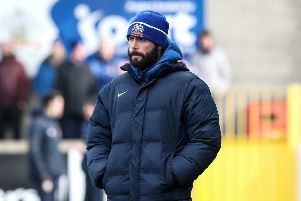 “It’s been very nice all season for me to be asked about Ballymena winning the title but (assistant) Bryan McLoughlin and I have been around for long enough to know how things go,” he explained. “The truth is we have been punching massively above our weight this year and for Ballymena United to be sandwiched in between Linfield and Crusaders at the top end of the table shows how very well we have done. “All season, I have said that our targets were simple. I’ve kept speaking about incremental steps – firstly, trying to claim a place in the top six and then trying to crack Europe. Winning the title was never something we spoke about. “Qualifying for Europe would be a massive achievement and we are still trying to do that. “We’re trying to replicate what clubs like Cliftonville, Crusaders, Glenavon and Coleraine have done in recent times. Ballymena could stamp their passports to the Europa League as early as next weekend if results go their way but Jeffrey – whose side could also reach the continent by finishing third, assuming Crusaders win the Irish Cup – maintains he’s focusing on the game rather than the rewards which may await. “I’m aware of the various possibilities that could be played out in the coming weeks but, any time my mind has wandered, I’ve just brought myself back to the same mantra – one game at a time,” he added. “Coleraine will give us a very tough match but we will go out and try to get the three points, regardless of what they might mean for us. Opposite number Paddy McLaughlin knows Cliftonville will contest the play-offs and Saturday’s stalemate with the Sky Blues strengthened their chances of a home semi-final when the end-of-term shoot-out comes around. “We’re still trying to build momentum and form going into what will hopefully be two extra games at the end of the season,” he said. “The players are working hard in every match and we’ve had a lot of positives since I came to the club. Cliftonville: Brush, Ives, Breen, Grace, Harney, C. Curran, R. Curran, R. Donnelly, Bagnall, Gormley, Gorman. Subs: Neeson (not used), McGovern (not used), R. Harkin (not used), McConnell (not used), Maguire (not used), McMenamin (replaced Ives 86), A. Donnelly (not used). Ballymena United: Glendinning, Addis, Whiteside, McCullough, McGrory, Balmer, Ervin, Lecky, Millar, McMurray, Watson. Subs: Williamson (not used), Kane (not used), Quigley (not used), Mayse (not used), McGinty (not used), Faulkner (not used), Shevlin (not used).